Triennale di Milano hosts two exhibitions addressing the theme of reconstruction. “Ricostruzioni. Architettura, città e paesaggio nell’epoca delle distruzioni” (“Reconstruction: Architecture, city and landscape in the age of destruction”) opened on November 30 , while “re/build in the built environment” opens on December 14 looking at the relationship between architecture and the built environment. The exhibition “Ricostruzioni. 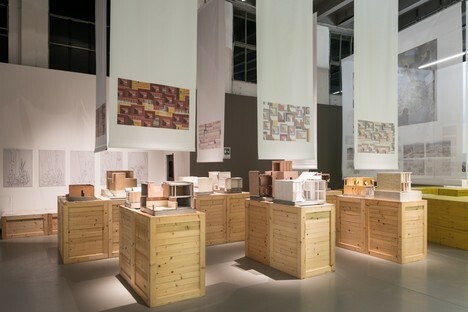 Architettura, città e paesaggio nell’epoca delle distruzioni” (“Reconstruction: Architecture, city and landscape in the age of destruction”) opened on November 30 at Palazzo della Triennale di Milano. In an immersive exhibition installation evoking the materials and structures typical of construction sites, the exhibition displays Italian and international architectural projects dating from different times in history to cast light on the practice and culture of reconstruction. The exhibition includes historic documents, original drawings and models, fragments of documentaries and films, and photographs by great photographers such as Giovanni Chiaramonte, Olivo Barbieri, Paolo Rosselli, Michele Nastasi and Filippo Romano. Each case is individually presented, reporting on the specific experience of each project in order to draw conclusions on important issues common to all. The exhibition features theme islands about international cases (Germany, England, France, Greece, Macedonia, Portugal, Chile, Japan) as well as Italian projects such as the post-war reconstruction, Vajont, Belice, Friuli, Irpinia, Pozzuoli, Umbria and Abruzzo. The exhibition also features technological and architectural experiments and a close-up look at the case of Syria. The exhibition concludes with a selection of design proposals, studies and initiatives collected while preparation of the exhibition was underway asking further questions about the role of architects and architectural culture in reconstruction, in a sort of open laboratory. Starting on December 14 another exhibition, also at Triennale di Milano, will address the theme of reconstruction in terms of projects requiring work on individual buildings in a built environment. “re/build in the built environment” is the title of the exhibition curated by Simona Galateo, which draws visitors’ attention to four international projects. The Morgan Library in New York underwent a renewal and expansion project by Renzo Piano Building Workshop in 2003-2006. Italian architect Renzo Piano doubled the library’s original surface area by combining into a single building three historic centres of the museum library: the Morgan Library designed by McKim, Wistar Morris’s annex building, and the Morgans’ mid-nineteenth-century home. The project also involved construction of a new entrance, a glass pavilion on Madison Avenue which now connects the different buildings in the complex and the upper and lower levels. aMDL Michele De Lucchi’s Gallerie d’Italia in Palazzo Anguissola in Milan, the Capitoline Temple in Brescia presented by the City of Brescia and the Architectural Heritage Superintendency, and lastly Terrazza Triennale in Milan by OBR Paolo Brescia and Tommaso Principi are the three Italian projects featured in the exhibition along with New York’s Morgan Library. The reconstruction projects presented in the exhibition testify to the wealth of different design approaches that can be implemented to make the most of our existing built heritage and update it for use today. With Capoferri’s assistance, a change was made to the structure of the exhibition hall for the exhibition, reinterpreting the original layout of the architecture and reopening three of the original windows from Giovanni Muzio’s design of 1933.